Mark Dilley's excellent blog has made me aware of the Labor Arts site, an excellent collection of labor themed artwork and exhibits. Mark linked directly to an excellent exhibit on the IWW (click here). For those who are not familiar with the IWW, the acronym stands for the Industrial Workers of the World, a Union for All Workers. This year, 2005 is the one-hundredth anniversary of the IWW, having been founded on June 27, 1905 in Chicago, Illinois, by a congress of workers including elements from Socialist Labor Party/Socialist Trades & Labor Alliance, Socialist Party of America, Western Federation of Miners and survivors of International Working People's Association. 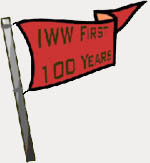 A full cronology of the first 100 years of the IWW can be found here. Anarcho-syndicalists believe that workers’ organizations — the organizations that struggle against the wage system, which, in anarcho-syndicalist theory, will eventually form the basis of a new society — should be self-managing. They should not have bosses or “business agents”; rather, the workers should be able to make all the decisions that affect them themselves. Anarcho-syndicalists believe that only direct action — that is, action concentrated on directly attaining a goal, as opposed to indirect action, such as electing a representative to a government position — will allow workers to liberate themselves. The IWW promotes the General Strike as the ultimate direct action allowing workers to become liberated from the bonds of capital. One of the other aspects of the IWW that makes it stand out is that it has from the beginning created media to promote worker culture. This includes art, comics, songs and poetry, to name a few. The IWW exhibit at Labor Arts explores this in detail. Many images can also be downloaded directly from the IWW here, here and here. A list of centennial events can be found here, including a James Connolly celebration in Albany, NY on May 14th. The New Realist -or- Tradition!